The school has many activities that include paints, oils and solutions that stain clothes. Montessori environments are “hands-on” classrooms—clothes get dirty and stained. 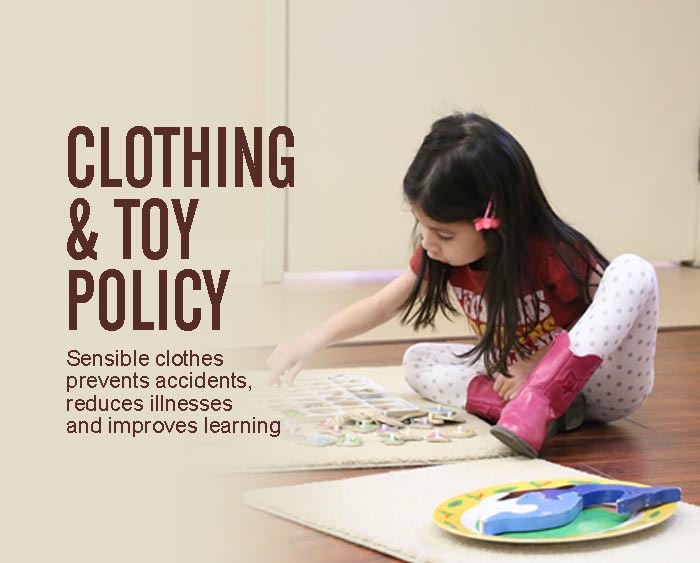 Pre-school children should be able to manage their own clothes—take them on and off. Belts, leotards, and overalls are often too unwieldy for young children. Avoid “accidents” with clothes they can remove. If they can’t yet tie their own shoes they should be wearing velcro-closing shoes. Sneakers or rubber-soled shoes are recommended. All clothes must be labeled. Clothes without a name tag that are lost (and we have many) will be collected and donated to the Goodwill store. A complete change of clothing or two must be kept at school. The school does not permit personal toys. If your child brings toys to school these will be confiscated without notice. The reason we have this policy is that toys create problems in sharing. Children learn to share things at school and if they bring their own toys, this sharing e experience becomes much harder to teach. Secondly, certain types of toys can create a hazard for other children. For example your child might bring marbles to school, but this could pose a choking hazard to another smaller child. Third, the school only has a finite amount of space for toys. If parents and kids bring toys to the school it creates a significant extra burden on the school in cleaning and maintaining these toys. The law requires us to provide sleeping facilities for children under 5 years of age. However we have sleeping facilities available for all children. Parents to supply and keep one (1) cot sheet and one (1) blanket for your child. Parents are asked to take these home every Friday, washed and returned on the following Monday.